Get Out the Vote (GOTV) with the Vote the Future team! INCO needs you to help Get Out the Vote in Astoria, Cannon Beach, Warrenton, and East County. Be part of the VTF team, or pass out Candidates Scorecards on your own. Contact incoregon@gmail.com. It's easy to remind people to vote and give them an INCO Candidates Scorecard. INCO isn't campaigning for any specific candidate(s). INCO will give you walking maps with addresses of likely progressive voters in a neighborhood. If you support a specific candidate in the May 15primary, then you can contact that campaign to offer your help with getting out the vote: going door-to-door and calling voters. Progressive candidates can't win if progressives don't vote. Contact incoregon@gmail.com to help with this important election work. we are going to have to engage and vote." www.indivisible.org Sign up for the weekly Americans of Conscience Action Checklist. Follow up on this week's Checklist issues you care about. Contact elected officials here. • Tell your senators to reject Gina Haspel as CIA Director. She personally helped torture detainees in a secret CIA-run prison during the Bush administration. She then made sure the video evidence was destroyed. Beyond waterboarding, detainees were sexually assaulted, beaten, isolated and starved. They faced mock executions, threats to their families, and psychological experimentation. More info here. Another article is here. • Tell your Members of Congress to uphold the rule of law and protect our democracy.Especially if Trump fires Rosenstein or Mueller or otherwise tries to stomp on the rule of law. More info here. • Tell your Members of Congress to co-sponsor Honest Ads Act (S. 1989/H.R. 4077). It would disarm foreign actors and bring advertising transparency into the digital age. Robert Mueller has already indicted Russian companies which spent $100,000 on 3000 Facebook ads alone. • Tell your senators to back Senator Markey's resolution to protect net neutrality on the internet. The Senate's vote is expected before the Senate in the next couple of weeks. An Indivisible calling script here. We encourage all Indivisibles to get involved with a campaign, to support the candidates of your choice, and to help get out the vote. Ballots are due on Tuesday, May 15, by 8 pm. Postmarks don't count. 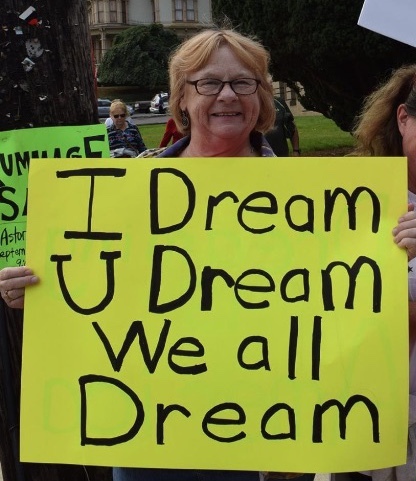 Tuesday, May 1 - Oppose Bigotry Team meeting - 6 pm, contact catladyjoan@gmail.com for directions to Astoria meeting site. Saturday, May 5 - Warrenton Community Group meeting and Adopt-A-Highway - 11 am, Dooger's Restaurant, Highway 101, Warrenton; no purchase necessary. We will have our first Adopt-A-Highway event immediately following this meeting. Come to the north end of the Dooger's parking lot. Wear long pants, long sleeves, sturdy shoes/boots and gloves. Other equipment will be provided. Most Fridays - INCO Southwest Washington postcard party; email gwenbrake@gmail.com for date, time and place. Tuesday, May 8 - Astoria Community Group meeting and Get Out the Vote - 6 pm, WineKraft, 80 10th Street, on the Riverwalk, Astoria, no purchase necessary. Bebe Michel, INCO's GOTV coordinator, and Seaside, Gearhart, and Astoria Indivisibles will canvass Astoria with the Candidates Scorecards, while people who don’t want to canvass can stay behind and have a meeting. All Indivisibles are welcome - INCO provides addresses of likely progressive voters and walking maps. Tuesday, May 8 - Seaside-Gearhart Community Group takes part in INCO's Get Out the Vote campaign in Astoria - 6 pm at WineKraft, 80 10th Street, on the Riverwalk, Astoria. No purchase necessary. All Indivisibles are welcome - INCO provides addresses of likely progressive voters and walking maps. Wednesday, May 9 - INCO Book Club - 6:30 pm, a home in Astoria.Contact cebeady@outlook.com for location. The May book is In the Country We Love, by Dianne Guerrero, Henry Holt & Co., 2016. It is only available in hardcover, but you can find used copies online at Powell’s Books in Portland. Tuesday, May 15 - BALLOTS DUE - 8 pm. Postmarks don't count. Local journalist Joan Herman interviews candidates on "Perspectives" on KMUN radio, 91.9FM. Her questions are spot-on, with time for meaningful answers. County Commissioners, Districts 1 and 3 - podcast is here. County Commissioners, District 5 - podcast is here. Oregon House of Representatives, District 32 - podcast is here. 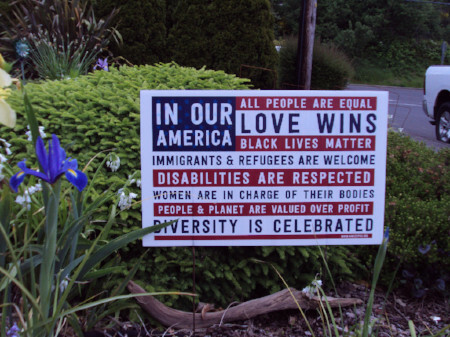 Spring into spring with an "In Our America" yard sign! Contact incoregon@gmail.com. We'll have these yard signs ($10) and INCO t-shirts ($15) at Ales & Ideas this Thursday, May 3, 6:30 pm, at the Lovell Showroom, 426 14th Street, Astoria. Here's what we'll do if Trump crosses one of three red lines that threatens the rule of law as it relates to the investigation: fire Mueller, fire Rosenstein, pardon key figures. Inform and inspire others with a letter to the editor (LTE) to the Daily Astorian. Letters are among the most popular features in the paper. Even a paragraph or two makes an impact. Rules and directions for submitting your letter are here. Tips for letter-writing are here. Check out this video about maximizing the impact of your words. Our safety net is under constant attack from Trump and his GOP. The attacks won’t stop until Congress changes. HUD Secretary Ben Carson proposed the latest assault: tripling rent for the poorest families with subsidized housing and allowing housing authorities to impose work requirements. Carson stated, “from a budget perspective” current levels of spending are “unsustainable.” The GOP tax scam has gifted Wall Street banks $3.59 billion in lower taxes in the 2018’s first quarter. This is proposal is especially cruel given the acute shortage of affordable housing. The Portland Housing Bureau found "[T]here are no neighborhoods affordable to rent for the average Black, Latino, Native American, and single mother households." Congress must work for people and not corporations. They must provide housing and food for America rather than tax breaks for banks. If this Congress can’t, we must vote in one that will. --you and everyone you know is registered to vote. --every candidate for Congress is answering questions about how they will work to protect our safety net. The 2018 elections will be the most important of our lives. Join in and help make a difference. Every society is judged by how it treats the least powerful among them. By that measure, ICE shames us all. Officers from the Immigration and Customs Enforcement agency have snatched mothers from families, fathers dropping their kids at school, and now we learn, hundreds of children from their parents. This week, NY Times reported that ICE has seized 700 children. Many of these children will languish in the system indefinitely. Inspired by Trump’s anti-immigration rhetoric, ICE arrests are up 40%. That will grow. ICE is surging in sanctuary cities, issuing new guideline to arrest pregnant women, and withholding humanitarian parole for asylum seekers. “This is the bitter fruit of dehumanization – in a facility, in a system, in a country,” wrote conservative columnist Michael Gerson this week. Hold hearings on ICE abuses. Withhold funding until abuses are corrected. In the November Midterm elections, remember the position of your Member of Congress on this issues. We are a more just and compassionate country than what we see ICE doing, and ICE is only a reflection of Trump’s agenda. These are lives being ripped apart. Children torn from mothers. This is not normal. Become an activist now. 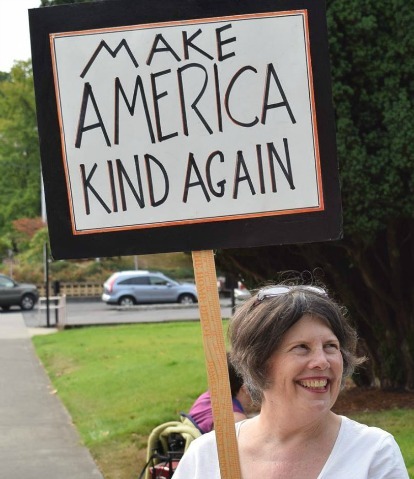 Check out www.indivisibleOR.org. Fight for what is right. Fight to restore America. K-12 education is among the national treasures threatened by fallout from Trump’s tax bill. Democrats negotiated a $2.7 billion increase in FY 2018 spending, but it took five continuing resolutions and a brief shutdown first. And funding is STILL less than 2008 levels. Trump will seek deep cuts again in FY 2019. We must urge our MoCs to keep fighting for public schools. Kansas experimented with radical tax cuts like those passed by Congress. They nearly wrecked the public school system. --- Funding is below 2008 levels in more than half of states, including Oregon. -- Teachers earn less than other workers with comparable experience and education — especially in states that have seen walkouts. -- Schools employ 135,000 fewer workers, even though students have increased by 1.4 million. Meanwhile, the nation’s six big Wall Street banks were bestowed at least $3.59 billion in taxes in the first quarter of 2018. We can’t afford to enrich the already-rich but make our teachers and children get by with less. Tell our MoCs to keep fighting for robust public schools in FY 2019, and to be ready to pass a fair tax plan if Congress changes hands after the midterms. --every candidate for Congress is answering questions about how they will work to make sure public schools are fully funded. The 2018 elections will be the most important of our lives. Our children’s future depends on it. While some of Trump’s action can be reversed, the US has permanently lost the confidence friends and foes have had in America’s commitments. This week, European leaders are trying to save the Iran nuclear deal from Trump. If that deal fails, it will inflame conflicts in the volatile region that could end in war. Next is the North Korean summit on nuclear arms. Last year, Trump called the North Korean leader “little Rocket man” whose country he would “totally destroy.” Today, Kim Jong-un is “very honorable,” says our Great Leader. Trump is approaching these perilous decisions handicapped by a decimated State Department, a National Security Council in flux (again), and no noticeable inclination to learn. His only consistency has been his irrepressible “bromance” with Putin. Putin can attack our elections, avoid sanctions, and help Assad kill children. Trump turns the other cheek. American isn’t a one-man government. Yet. If you have the energy, work for candidates that will help to end our long national nightmare. Healthcare is a human right, needed for each person to reach their potential. Democrats work to expand healthcare while Trump and his GOP systematically take our healthcare away. --Approving Medicaid work requirements which will cost thousands their healthcare - up to 97,000 in Kentucky alone. Work requirements don’t lead to sustained employment and place undo administrative burdens on participants. --Proposing to expand short term plans to one year and to include “junk insurance”. Junk insurance is not required to cover essential health benefits or preexisting conditions. When combined with the repeal of the individual mandate, these changes will increase premiums up to 18%. Meanwhile, Democrats have FIVE different plans to expand Medicare and/or Medicaid. --every candidate for Congress is answering questions about how they will work to make healthcare accessible for all. The 2018 elections will be the most important of our lives. Our very health depends on it.